Yesterday, we reported on an alarming development for the future of electric cars: we may not have enough of the crucial minerals needed for their batteries to meet the expected demand. Supplies of nickel and cobalt are going to be needed in far larger quantities than ever before, and it’s looking like we may not have the necessary resources. Though, it’s worth mentioning that this is only a problem if you have what the intergalactic call a “planetary mindset.” There’s plenty of what we need just outside our door, in asteroids. Asteroid mining has been discussed and planned and speculated about for decades, but so far there’s never really been a compelling economic reason to take the risks inherent in starting an entirely new, space-based industry. Electric car demand may be that crucial factor that changes everything, though. Nickel and cobalt of sufficient quality and quantity may be becoming scarce on Earth, but there’s literally tons and tons and tons of the stuff pirouetting around in the inky black of space. There’s incredibly, astoundingly valuable asteroids out there, and many we’ve already identified, like 241 Germania, which has as much mineral value in it as the entire Earth’s yearly GDP. Nickel and cobalt are abundant elements in these asteroids, and researchers have even already picked a dozen small asteroids close enough to Earth that they could be mined with just the technology that we have right now. Those 12 asteroids are close enough to the L1 or L2 Lagrangian Points—stable areas where the gravity between two bodies, like the Earth and moon, cancel one another out—that getting them to these stable, accessible orbits is easy enough that researchers call them EROs, for Easily Retrievable Objects. 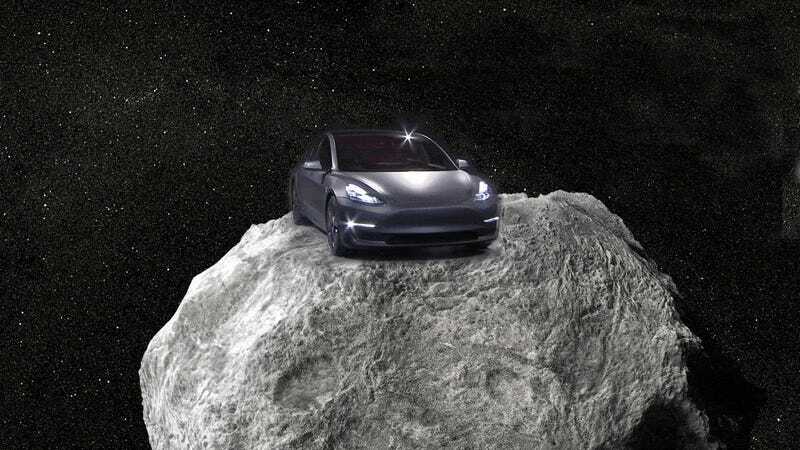 While in-space use of asteroid mineral resources is absolutely important, the recently seen expected demand for electric cars—most obviously seen in the amount of interest and pre-orders Tesla got for its upcoming Model 3—changes things dramatically. 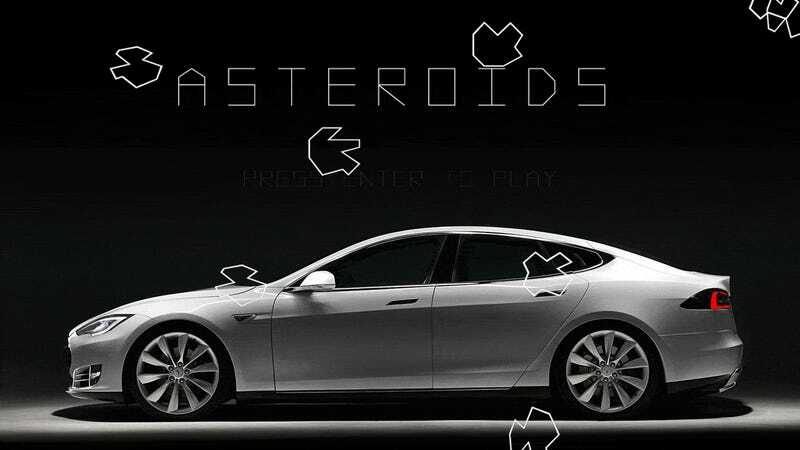 Electric car demand could easily be the backbone of the justification for asteroid mining that returns resources to Earth. For comparison, $2.6 billion is how much money Lyft has raised. Lyft! What have they produced? Fuzzy pink car-moustaches and an app, neither of which can grab asteroid one. Legally, things are looking good, too. An Obama-era law, the U.S. Commercial Space Launch Competitiveness Act, was passed that acknowledges that while legally no one can own the moon or an asteroid, private companies can own any materials taken from those celestial objects, which means asteroid mining for profit is legal. If electric cars provide the economic push needed to get us to send grizzled robot space prospectors out to get that sweet, sweet space-cobalt, it’s hard not to see a possible significant competitive advantage for one of the key players, Tesla. That’s because as we all know, Elon Musk is behind not just Tesla but SpaceX, likely the most successful private space-launch company around. SpaceX has capable launch vehicles and likely the expertise to design and build robotic mining spacecraft, which could give Tesla total control of their entire vertical from mining the resources in space, transporting them back to Earth (humans have been sending material from space to Earth since the start of the space program, remember), manufacturing those resources into batteries, and from there into electric cars. Has this been Elon’s plan all along? Has all the Mars colonization hype just been a red-planet herring to distract us from his real preparations for large-scale asteroid mining? Probably not, but it’s fun to think about. There’s also an environmental argument in favor of asteroid mining for electric car batteries. Where electric cars are far cleaner at the car level, they still take an environmental toll to build, since mining isn’t exactly the most eco-friendly endeavor. Moving that part of the equation off-planet would made the overall life cycle of an electric car vastly better for the Earth, for the simple reason it’s just not happening there. While exploration and our innate desire to explore and learn is what took us to space in the first place, if we’re honest with ourselves we know that a large scale push off Earth won’t happen until there’s money to be made out there. Thanks to our demand for electric cars, we may finally be there. Spaceward ho! There's cobalt in them thar 'roids!